When an array of opinionated shapes just can’t find common ground, AND comes to the rescue. AND is the link that helps each pair of shapes overcome their differences, teaming up to create something entirely new. Bouncy rhyming text and colorful paintings come together in a fable that will prompt children to look for the unexpected connections all around them. 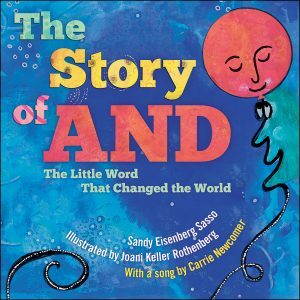 Singer/songwriter Carrie Newcomer has recorded an original song based on the story, available to readers as a bonus download at www.flyawaybooks.com/resources.